dotFes (dot festival) is a one-day event full of design and ideas for Web creatives organized by “Cshool” and “DeNA”. With the first event held in Tokyo, Shinjuku in 2008, we have offered many talk sessions, live performances and installations and then the event was hold in Okinawa & Kyoto in 2009, Tokyo in 2010, Kyoto in 2011, Sendai in 2012, Kyoto in 2013, Fukuoka in 2014 and Shibuya in 2016. 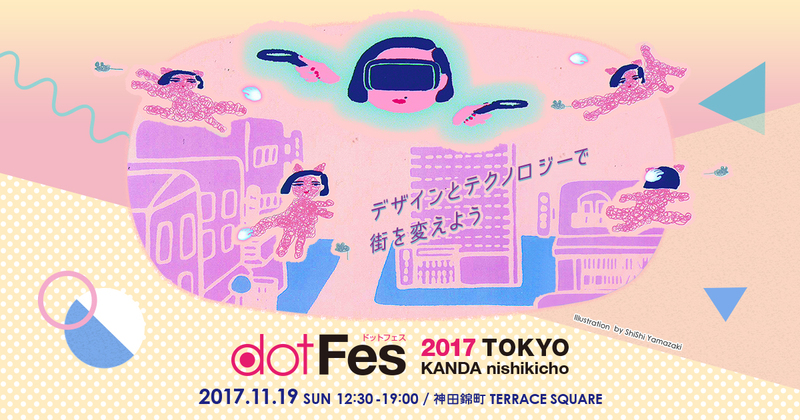 And dotFes is welcoming its tenth edition in 2017! This time it will be held in downtown Kanda Nishiki-cho! Let’s enjoy that day together with lively and stimulating talk sessions, installation, exhibitions etc. by various creators, communities, technology vendors etc! We look forward to welcoming you on that day!